Both Linda Teddlie Minton and Susan Fletcher King of FiberVoices have had their entries accepted into the juried invitational exhibit, "Rituals", curated by Dinner at Eight Artists' Jamie Fingal and Leslie Tucker Jenison. The exhibit will debut at the July, 2012 International Quilt Festival, Long Beach, and will also show at the Houston International Quilt Market and Festival in October/November, 2012. 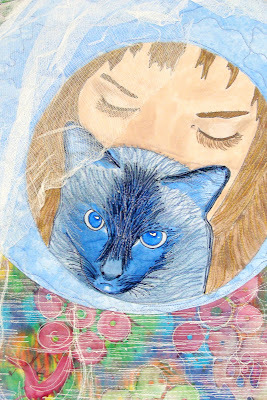 "Kissing the Cat Goodnight", 24x60"
We'd like to join Jamie and Leslie in thanking our sponsors for this exhibit ... Moore's Sewing Centers at the Long Beach show, and Havel's Sewing at the Houston show. Their support is hugely appreciated.